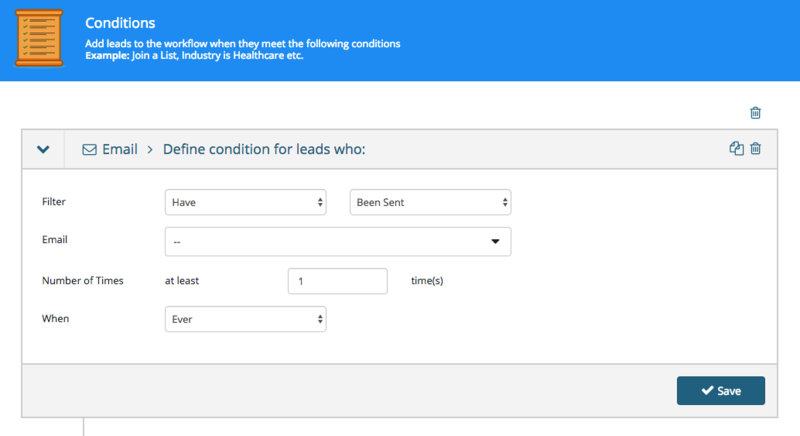 List-A condition for a list can include anyone who are, are not, have been, or have not been part of a specific list within your Leads Database. Choose your filter and then select the list by clicking on the downward arrow to display all available lists from the dropdown menu below. Page view - A page view can include anyone who has has or has not viewed a page over a set duration of time. In order to set up the condition for a pageview, you must first ensure you have installed the tracking pixel onto the page that you want to monitor. 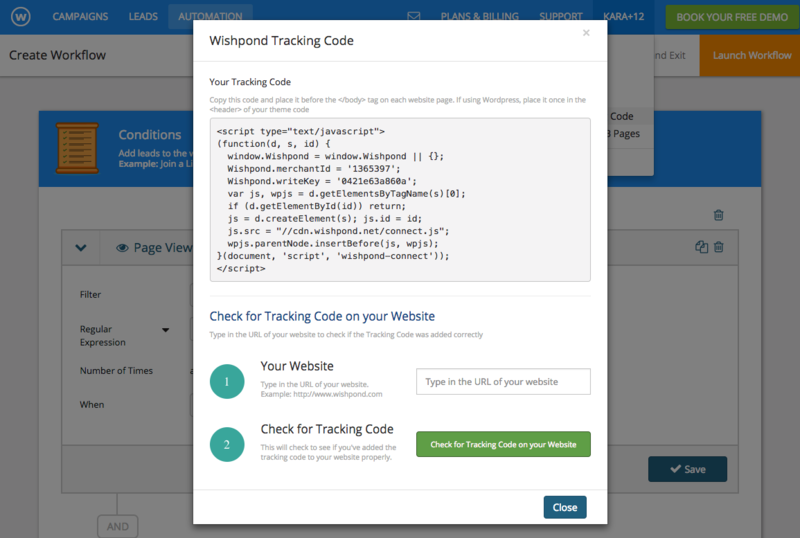 To do this, click on the drop down menu from the top right of the screen and select “Wishpond Tracking Pixel”. This will provide you with a piece of code which you can paste into any HTML website in order to track page views in Marketing Automation. Email - A condition for email can include anyone who has or hasn't taken a number of actions in regards to an email sent or received from inside of Wishpond. Some of those include whether they have received an email, opened an email, or clicked on a link inside the body of an email. 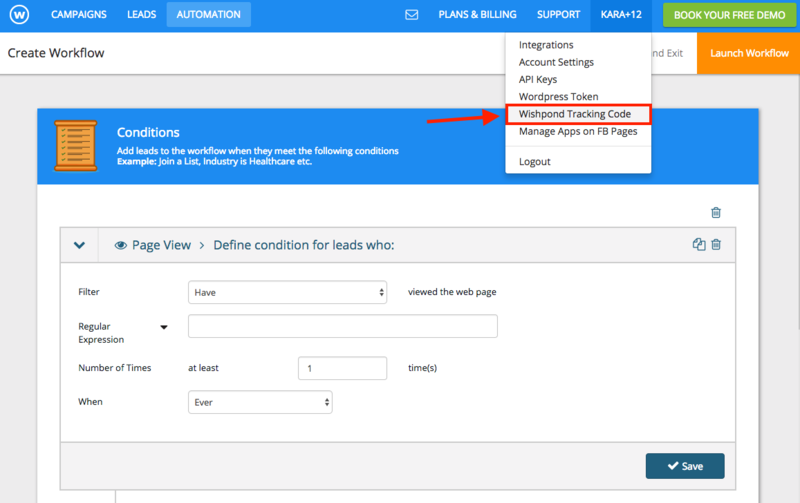 Lead Property- A lead property can group together or filter out all users who either are or are not part of a specific global lead property group. Examples of this could be people from a specific country, divided by gender, users above or below a certain lead score, etc. 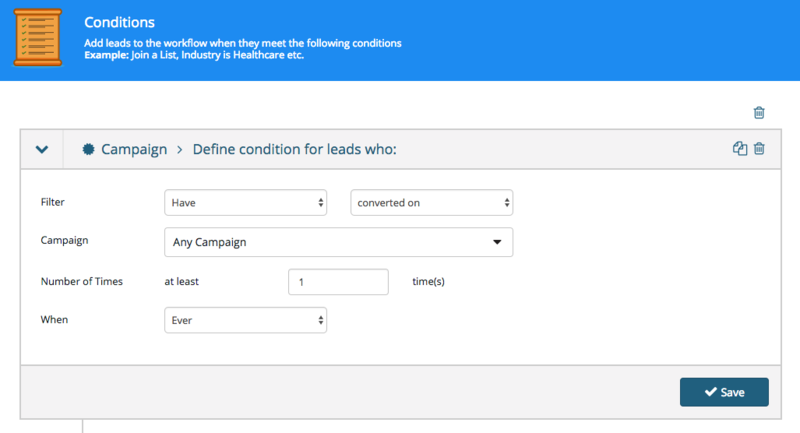 Campaign - Campaign can sort by people who have or have not converted on one of your wishpond campaigns over a set amount of time. By clicking on choose campaign you can see a drop down list of all the available options. Below you can set the number of times and over what period of time this condition will be applied for. Workflow - A workflow event uses workflows as a condition by specifying whether someone has completed or started one of your workflows in the past. You can select the tab workflow to take a look at all of you available options. ** After you select your conditions you’ll notice theres a section in the middle of the page called condition settings. Condition settings are a more advanced set of options that specify under what conditions leads should or should not be added to a workflow. 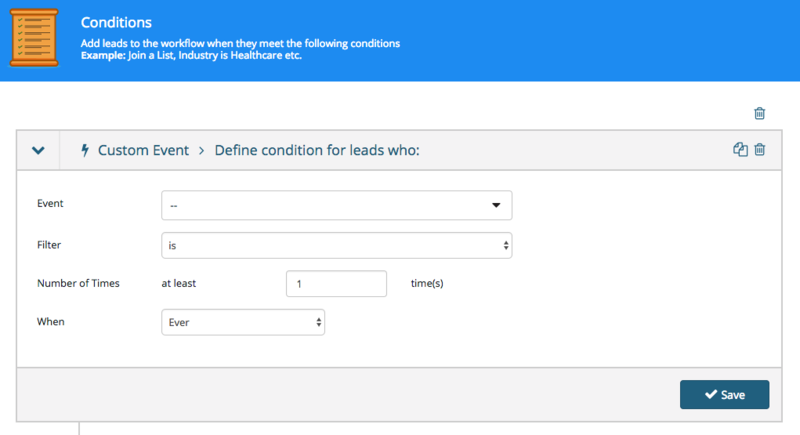 By default “add leads who match these conditions” will be selected. If this box is unselected, it’s important to know that all previous leads that match these conditions will not be added to the workflow.